City Minister Andrea Leadsom visited Entpreneurial Spark’s newly launched Birmingham hatchery as applications opened for the city’s next tranche of budding entrepreneurs to join the business accelerator programme. 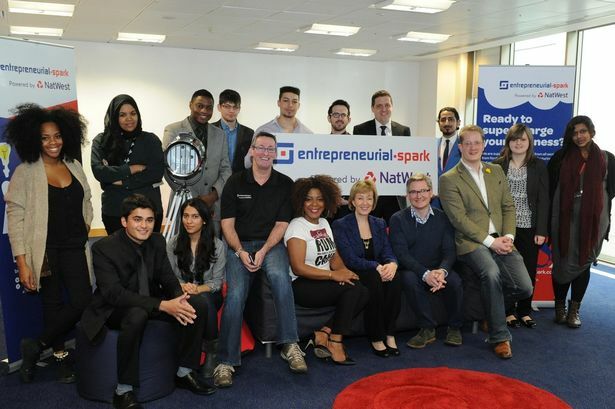 Entrepreneurial Spark has partnered with NatWest to open eight new hatcheries across the UK over the next 18 months. Birmingham was the first to be unveiled, with NatWest’s office at St Philips Place launching last month as the home to 80 start-up businesses. In the hatchery, the start-up businesses or ‘chiclets’ receive free office space, wi-fi, expertise and advice for up to 18 months. The hub also offers the entrepreneurs the opportunity to pitch to potential investors. Ms Leadsom was visiting to see first-hand how Entrepreneurial Spark supports start-ups as they seek to grow their businesses. During the visit she met Jim Duffy, CEO of Entrepreneurial Spark, and a number of chiclets. Ms Leadsom said: “Small businesses are the lifeblood of our economy, which is why a key part of our long-term economic plan is helping them get the support they need to grow and succeed. “There are firms up and down the country who are working hard every day to get their business off the ground or to grow further. Mr Duffy said: “We are delighted to have launched in Birmingham with NatWest. “Our tried and tested accelerator programme has already had a significant impact on the start-up community in Scotland, helping 350 businesses to create over 1,000 jobs and £41 million in turnover to date. “Birmingham has been found in a number of pieces of research to be the most entrepreneurial city in the UK, so it’s a fitting place for our first hub in England. “Our message to entrepreneurs is work hard, focus and ‘go do’ to achieve the business success of your dreams.